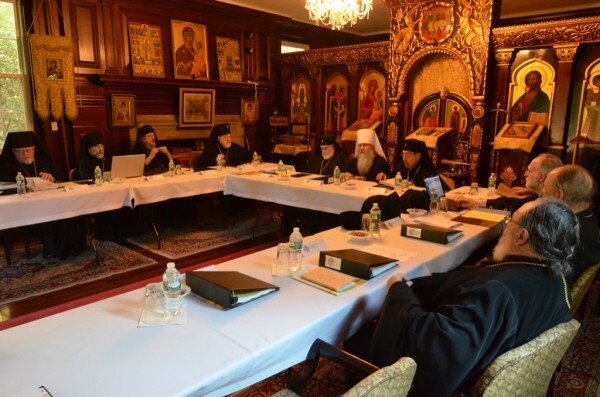 The fall session of the Holy Synod of Bishops of the Orthodox Church in America opened on Tuesday, October 21, 2014, and will conclude on Thursday, October 23.
full reports by the Chancellor, Archpriest John Jillions; Secretary, Archpriest Eric G. Tosi; and Treasurer, Ms. Melanie Ringa—as well as updates on the work of SMPAC/ORSMA. a detailed review of plans-to-date for the 18th All-American Council, slated to convene in Atlanta, GA July 20-24, 2015.
a presentation of the 2015 budget for approval. an interim report of the ongoing work of the Statute Revision Committee, chaired by His Eminence, Archbishop Nathanial. According to Father Eric, reports will also be given on the OCA’s 2015 Plant Grants, legal matters, canonical issues, and plans for the upcoming year. There will also be a session on clergy matters as well recommendations from the Board of Theological Education. As part of the ongoing rotation of OCA Department reports, Archpriest Theodore Boback will speak on on the work of the Military Chaplains, while Prof. Dr. David Drillock will update the hierarchs on the work of the Department of Liturgical Music and Translations.